← The Most Exciting Parcel; chapter two. As many of you will appreciate, with the gradual return of unbroken nights comes the equally gradual return of one’s ability to think straight and plan ahead. Slowly my doll-making skills developed and I began selling dolls to others, even complete strangers! I made my first attempt at a business name (Scots Dolls) and website (now dismantled). I discovered that there were Waldorf-doll lovers all over the world and I would need to be more active online if I wanted to reach some of these people. Through social media and a Facebook page, I started talking with my Swedish family about dolls again. 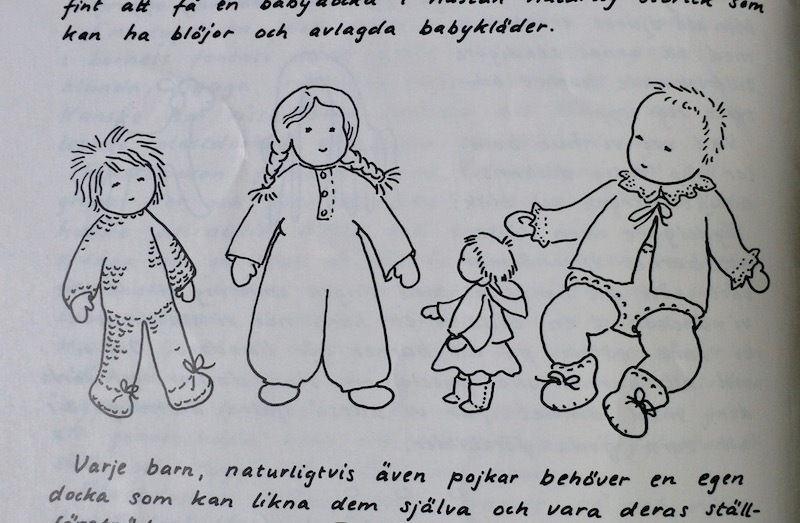 Out rolled the story of how I had begun, and the doll-making book I had so loved from Sweden. But this time I had a new idea. My cousin now also had young children of her own and little time to sew for them so maybe I could offer an exchange? Would my cousin try and find a copy of that long lost book in exchange for a doll for her family? 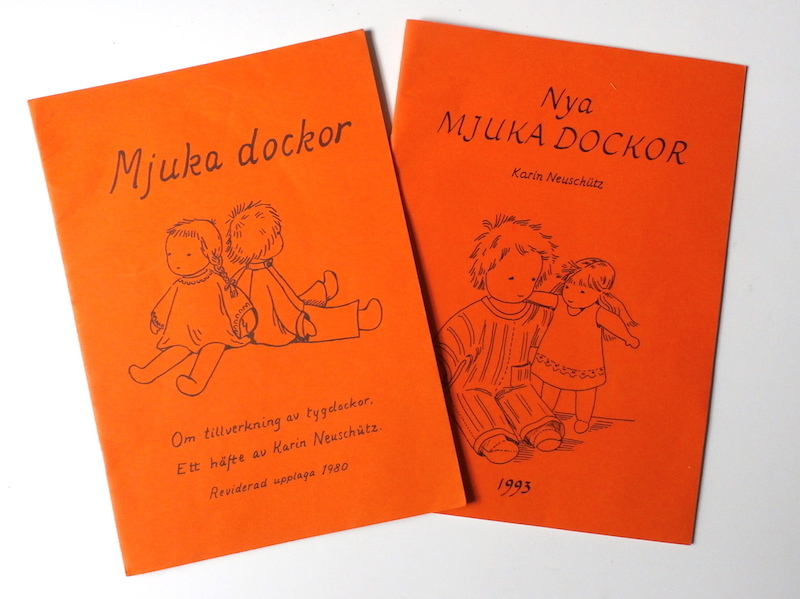 Perhaps my Auntie still had the small dolls book and they could start from there? This proposal was received with enthusiasm, so we both set about our tasks. I wanted to make a doll that was not too gender specific, and not too old-looking. A doll with colouring that reminded me of my Swedish family, but didn’t really resemble any of them. My cousin sent agonised messages about Ebay bids made and lost. The book had possibly been identified, but there seemed to be different editions, it wasn’t clear which one I had owned and none were still in print so getting hold of a copy was proving challenging. We both worked, and waited. And then without warning, the parcel arrived. I knew straight away what could be inside. It needed quiet and space and time to myself, so it sat all day in our hallway waiting for the right moment. When our family were all busy playing, I took it out into the garden sunshine with a pair of scissors and carefully cut open the end. Not one, but three books! My wonderful cousin had sent me copies of all that she could find in the hope that one was right. And one was. I sat and held it, trying to remember what was inside before opening the cover. And do you know, I remembered every page. 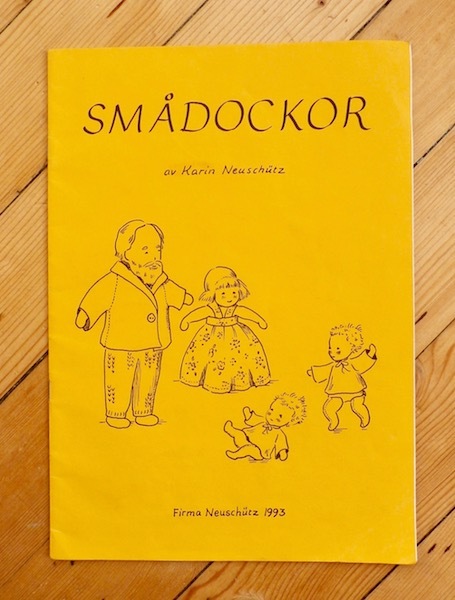 Reading the title page, I learned that the copy I had originally owned was ‘Mjuka Dockor; Om tillverkningav tygdockor’ Et hafte av Karin Neuschutz. Reviderad upplaga 1980. How fitting, it was the same age as me! But then came my second surprise, the author of this first doll-making book of mine was also the author of my most recent doll-making book! I had wondered at the familiar feel of Neuschutz’s ‘Sewing Dolls’, which I referred to often, but had never questioned why this might be. Now it made complete sense. It was so special to read that book again, and I still have a flood of memories whenever I take it out. The power of books is amazing. So now I had all the old patterns to work with again, plus a copy of the Small Dolls book, and an updated version of the larger doll book with more patterns included! 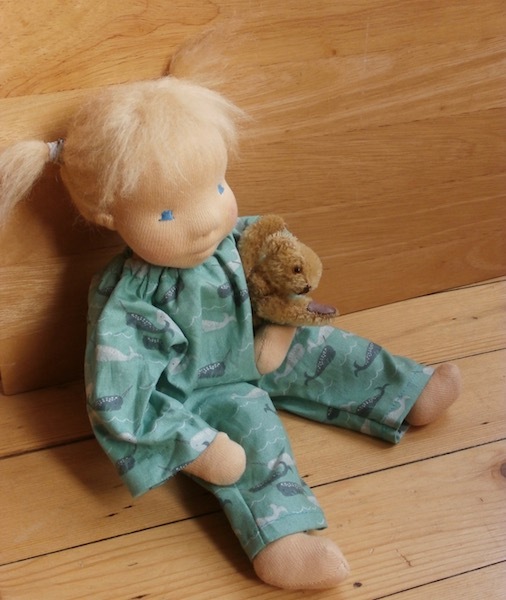 It was time to finish the doll for my cousin, and I would make it one of the romper suits from the pattern in the book that I had never gotten round to trying. As with all things, this took much longer that I anticipated and the doll is only just finished. I took her out with us today on a trip to the park and the weather was clear and bright so good for photographs. Here she is, enjoying the Edinburgh autumn sunshine. My doll-making journey has come full-circle and I feel ready to begin a new chapter. 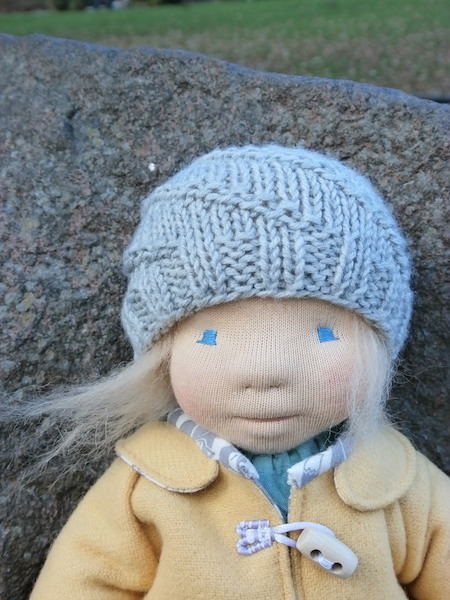 As this doll travels to her new home in Sweden, I am working on the final edit of my own first doll-pattern. This will be only a single coat pattern to begin with, not an entire book, but I intend to illustrate it much like a simple picture book. Who knows, perhaps somebody will learn from my pattern and remember the drawings I am now working on as I remembered those from Neuschutz’s book. That would really be something special.